We went to the Council of Chiefs and they did not need to stop and think about it, because they understood that everyone in the community has a task to do when making and sailing a canoe. It doesn’t matter if it’s building a house, going fishing or making a canoe … everyone has a role, including the women. Taula Milne’s education began at Rita Elementary School and continued on to Majuro Middle School. And that’s it. Done. The End. Taula is one of 25 trainees now half way through their six-month WAM vocational program, which began as a wonderful cultural concept of reviving the art of canoe building over 30 years ago. And so at 5pm on Monday, families and friends of the trainees and the program gathered in WAM’s headquarters/school room next to Ministry of Education. The keynote speaker was Allison Nashion, head of the RMI National Training Council (NTC), which is the main source of funding for the program. “WAM fills many of the focus training areas that are important to NTC, with the goal being to give them a sustainable livelihood,” he said. As part of this goal, Allison said that NTC is a source of employment information for graduates of all the programs it supports. “Job seekers can come to our office, which is in the tall building opposite Marshall Islands Resort, and we can help them with resumes and prepare them for job interviews. 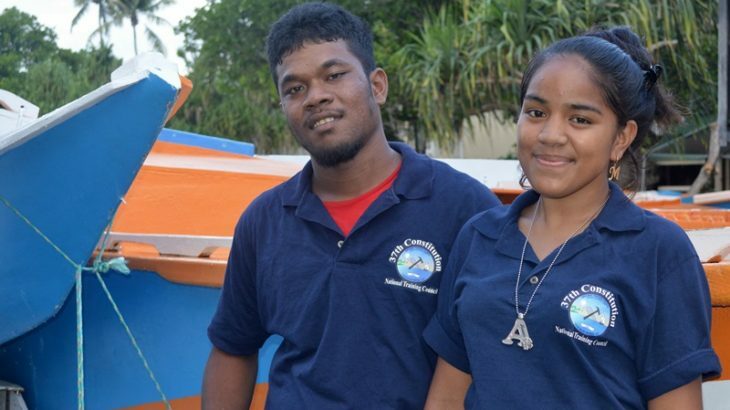 We can also help them look for advanced training at places such as Job Corps in Hawaii.” He added that currently there are over 100 Marshallese students in the Job Corps program in Honolulu and Maui, Hawaii. The second student speaker was Mary Ann Kiluwe, who also delivered her speech, this time in Marshallese, which was also followed by a robust round of clapping. In recent weeks, a group of the trainees has been working on making a new design for the WAM T-shirts and on behalf of the artists, Scamyo Namdrik told the audience how much they had enjoyed the process. Following the speeches the audience was invited to visit the big A-frame Canoe House and view the cunning miniature canoes that have long been a signature product of WAM and the construction of two full-size sailing canoes. Also on display were a series of pandanus pounders and strippers the students are making for the jaki-ed revival program at the University of the South Pacific. Clearly, the WAM trainees have been busy … and will continue to be as they move forward to a brighter future. Trainees' tales, What's new. permalink.